The Wrap and Snap Dog Harness is easy to use, lightweight and won't strain or choke your dogs neck. They have a four way adjustment which you set the first time you use it, then just Wrap Snap and Go. This harness is very lightweight for hot summer days. It has a cute embroidered surfboard and palm tree on the back, coordinating trim and matching leash. The American River Dog Harness is designed for Christmas!!!! It has a fun Snowman print, easy to use, lightweight and won't strain or choke your dogs neck. This harness has reflective strips for walking at night and it tested to hold up to 386 lbs. Keep your dog warm this fall and winter with the Frost Winter Dog coat is comfortable and fashionable. No need for a harness with this coat, it is integrated into the vest. This Red & Blue Stripped dog harness is comfortable and stylish. The harness is a simple design, comfortable and easy to use. The American River Harness is designed for Christmas! It has a fun HO HO HO print on a red stretchable fabric. Easy to use, lightweight and won't strain or choke your dogs neck. The right Harness is important for a safe and enjoyable walk. Let us help you find the right dog harness for your pup, to ensure their safety during walks. 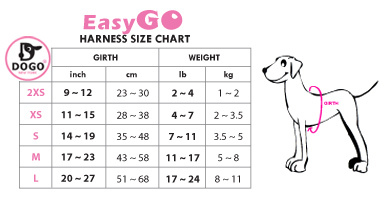 We have a variety from a simple dog harness to apparel with a built in harness to meet your dogs style needs. Harness wear is dual purpose, especially functional during fall and winter, see the coats with a built in harness.